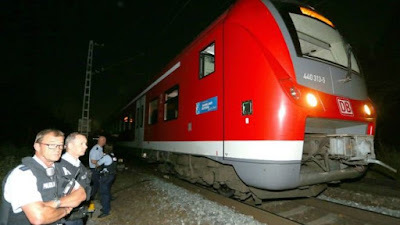 More than 20 people have been injured and some have died after a man began attacking train (on the red one pictured above) passengers with an axe in Germany. 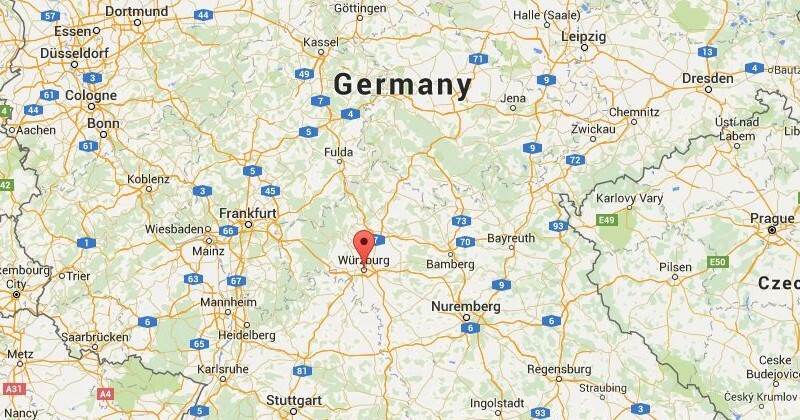 The attack happened on the train line between Wurzburg and Heidingsfeld. 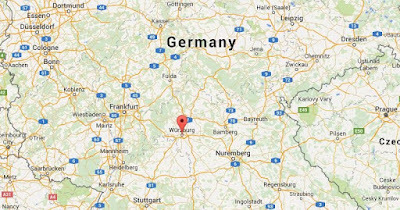 The site is between Frankfurt and Nuremberg. The attack took place as the train was traveling between stations. The train made an emergency stop short of the station at Wurzburg-Heidingsfeld and the assailant jumped out of the train. Police hunted the man down with ground searchers and a helicopter. The assailant, armed with a knife and an ax, was identified as a 17-year-old Afghan man living in Ochsenfurt, Bavaria, according to Bavarian Interior Minister Joachim Herrmann. The ax-wielding man has been shot dead by police, according to Lt. Fabian Hench, regional police spokesman. Four passengers who were attacked are in serious condition, with the total number of wounded unclear, although over 20 injured is reported by police and others. The attacker's motive is not yet known, Hench said. The attacker remains unidentified, for now. Shall we employ a new word in America for rampages? Mass shootings and frenzied attacks have become all too routine in the USA. It's time for a new term. 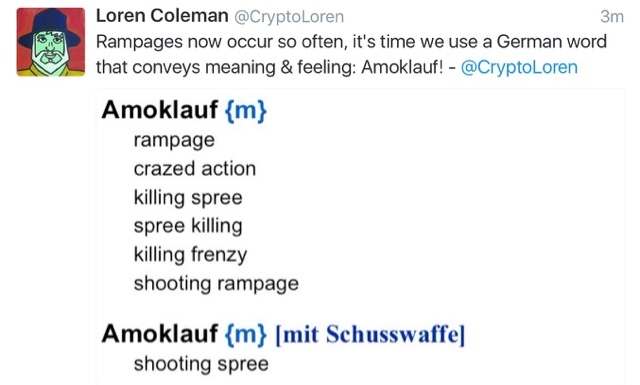 Let's use the German Amoklauf, which combines the Malay word "amok" (rampage) and "lauf" (run), as in "running amok." The Würzburg witch trials, which occurred between 1626 and 1631, are one of the largest peace-time mass trials. In Würzburg, under Bishop Philip Adolf an estimated number between 600 and 900 alleged witches were burned. This event gives me the opportunity to dust off my German since the US Army taught me to speak the language while I was on active duty during the Vietnam War era. I was later stationed in Munich so I'm familiar with some of the US Army outposts still active today in Munich, Augsburg, Frankfurt and also in Würzburg. I like your idea of using Amoklauf as a new import word from German. Perhaps it will catch on and stick like the last one: Schadenfreude. However, you might also want to consider using the German word for “copycat” (Nachahmer) a word I found in a sub-headline this morning in an online Swiss newspaper. I copy and translate a relevant sentence. Perhaps the Bavarian Interior Minister knows about your work. Nizza Nachahmer? = Nice Copycat? Herrmann stellte auch einen möglichen Zusammenhang mit dem Anschlag von Nizza her. Dass es immer Nachahmer von solchen Taten geben könne, sei bekannt. [Interior Minister] Herrmann also suggested a possible connection with the attack in Nice. It is well-known that copycats of such attacks are always a possibility.